Please make yourself known on the forum if you intend going on this trip. Whilst its marked as a training session, it is also a damned good paddle. You don’t have to join in with the training, just enjoy the trip. Woolacombe Woolacombe, Woolacombe, We’re all going to Woolacombe. Don’t forget Woolacombe Surf weekend Friday 3rd May is fast approaching. Book your pitch, check your camping gear, your boat and most importantly your sense of humour. Should be a good weekend. I believe this will be the highest turn out of club members for this event. See Events. Monday 8th April pool Session. Busy, busy, busy, lots of people in the pool practising their stuff. One end of the pool had a mini roll clinic the other end safety and rescue, with each group being put through their paces. Really nice to see the newer members of the club trying out different boats and going through various strokes at their own pace. Don’t forget if you want help with anything please ask. Practising in the pool is the best place to get it wrong! Nice warm water and plenty of eyes watching you to keep you safe. The Friday evening paddles offer an ideal environment to put into practice your newly acquired pool skills. Apart from being a nice paddle it will help blow away the stresses of the week and set you up nicely for the weekend. Crazy weather and mad people. 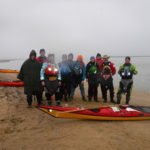 A lot of BCC members have been enjoying the strong winds as of late, getting out amongst the waves on the mighty Blackwater. 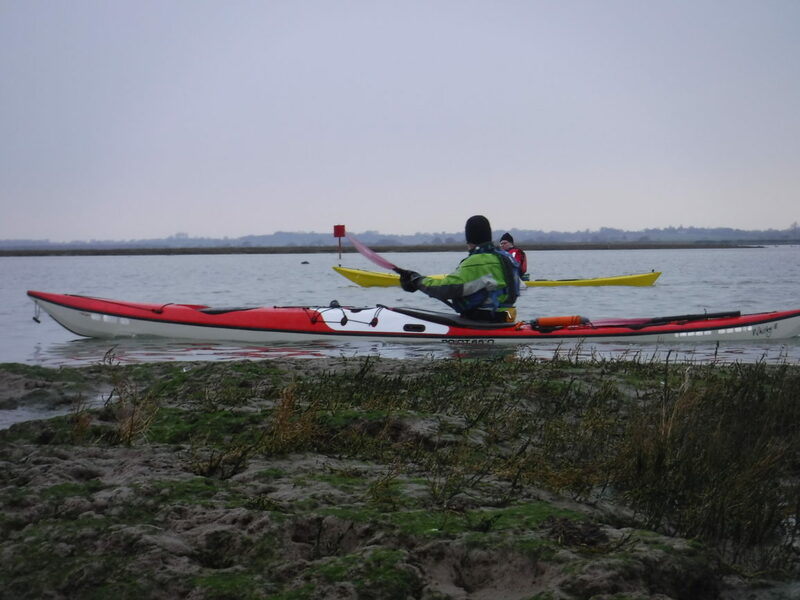 A one way trip from Heybridge to Bradwell, in exciting conditions, a cheeky paddle around Canvey Island and a very windy open boat paddle from Hoe Mill Lock to Rushes weir (Sunday 10th March) has had everyone smiling like Cheshire cats. I’m pleased to say the sail paddles worked well with varying degrees of success, and when the wind really caught the sails the boats took off. If you are the proud owner of one of these devices get out and practice with it, you’re in for a laugh! If you weren’t there, you missed out on this rescue session. Monday night was rescue night Shout .. Reach…. Throw….. Go…..& Row….. We also had some great demonstrations from Anna & Barry, Anna definitely had the upper hand as she managed to play bad victim really well & drowned Barry twice ! 😂 (Only pretend drowning you understand – we’re a very responsible club & take H&S very seriously indeed !) We also had boat to boat rescues practising ‘T’, ‘H’ & dead man rescues (again not really dead, only pretending see above re; H&S). The AGM has now taken place and the new committee has been formed. The minutes from the AGM will be sent out shortly by our Secretary Mike. As has now become customary, the post AGM paddle went ahead despite the rather windy conditions. Paul will be writing a blog on this trip, his maiden “wild sea” voyage. Many thanks to all those who attended the meeting and braved the paddle afterwards, and a special thank you to Marconi Sailing Club for allowing us to use their facilities for this event. Ok you’ve got the message AGM is next Sunday 10th Feb! If you have anything you would like to discuss or raise please let a member of the committee or the secretary know beforehand if possible. Don’t forget your kit if you intend paddling. What a busy couple of weeks. Training sessions, impromptu paddles, sneaky paddles and for some no paddles at all. Ebay has been kept busy with bargains being purchased such as ponchos and sailing kites, all good stuff. We had another demo night from Nucleus Watersports at the pool side along with a lot of one to one training taking place as well as group sessions. 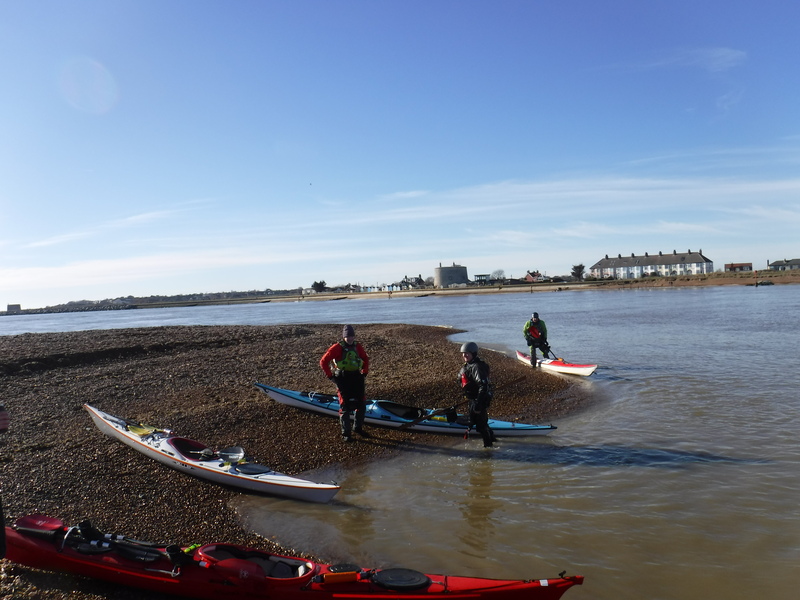 And just as you thought it couldn’t get any better than the OB training at the end of Jan along comes a sea kayak training session off of Old Felixstowe. Very well supported amongst our sea kayaking members, lots learnt, lots to think about,lots of swims and lots of rescues to think about too! Here’s a picture of Mark after he’d stopped messing around in the water. He was trying to preserve his gel coat from the shingle beach – apparently. 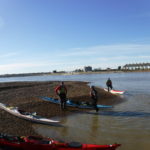 The weather was fantastic, the training was brilliant and, as ever with Bramston Canoe Club, good company comes guaranteed. Thank you to Barry I and Kevin R for organising this training session. You should all have received the agenda by now. If you have anything you would like to discuss or bring up/have represented, please let a member of the committee know or send an email to the secretary. Please let our Secretary know if you intend paddling afterwards. No matter what state of the tide we will be able to get on the water. The wind will be our deciding factor. For the less experienced sea kayaker, there are enough sheltered areas for you to get your boat wet. Don’t forget to bring your eggs and bacon and cooking wares, and for the those without – sandwiches. New boats arrived along with some new spray decks and also an impromtu demo night courtesy of Kent Canoes. Some members have been showing off their xmas presents, along with their new acquisitions. The paddling calendar trips and expeditions are already in full swing. Keep an eye out on the forum, events Calendar and other BCC media to know whats going on and where. People have already started booking campsites for our up coming surf weekend in May. Cracking paddle around Walton backwaters, thanks to Anna J for her suggestion and to Barry I for organising it. Friday evening Paddles during (British Summer Time) see trips forum. See The Trips Forum and Training Forum for more up to date info. Beginning of the year there will be lots of training announced, White water, Sea, Surf and Touring and the Lundy Island adventure 2019 TBA. Scotland 2020. A week of sea kayaking on the west coast with plenty of wild camping! Isle of Man 2021 A week on this beautiful island, perhaps even paddling the open crossing there! More info on all trips can be found on the Trips Forum page and EVENTS calendar. Extra trips are always added throughout the year. Training for 2019 is being worked on alongside the trips/events calendar so we can blend everything together. New personal awards are being rolled out by BC so they wont be called 2-3-4 and 5* anymore but it’s only a name, your personal development in your chosen discipline is still achievable. Speak to a coach, they don’t bite and they can get you pointed in the right direction. With that said all my Sea trips planned will incorporate something to work on! 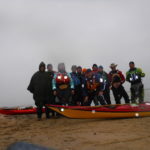 We need to look at and work on personal paddling skills, practical Navigation, tidal planning, distance, team work, group kit, personal kit, rescues, first aid exercises, scenarios (stuff happens)! Our Monday night pool sessions are always full of training opportunities, use them. Training trips will be published as and when. Normally when the weather is warmer. Keep an eye out on the Training forum and Events Calendar.